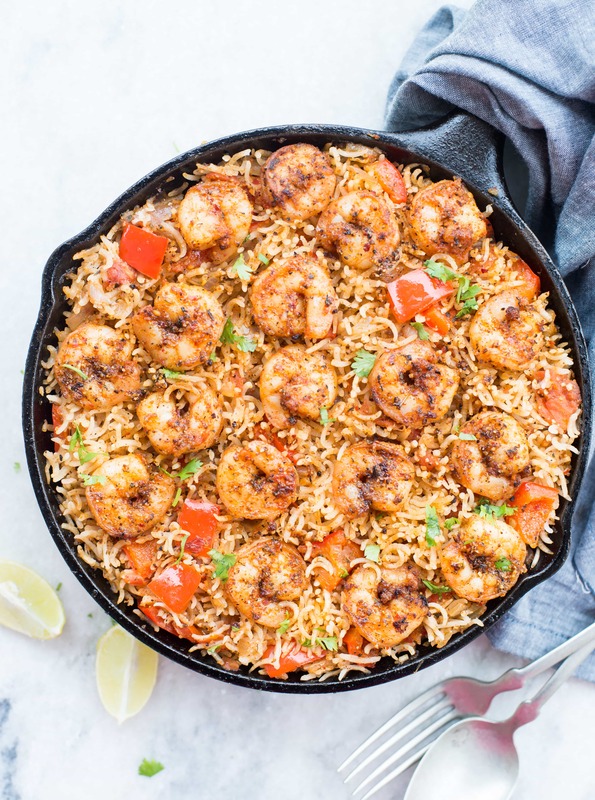 Cajun Shrimp and Rice Skillet are that one pan dinner recipe, your family is going to love. It is spicy with lots of flavour from Cajun Spice. 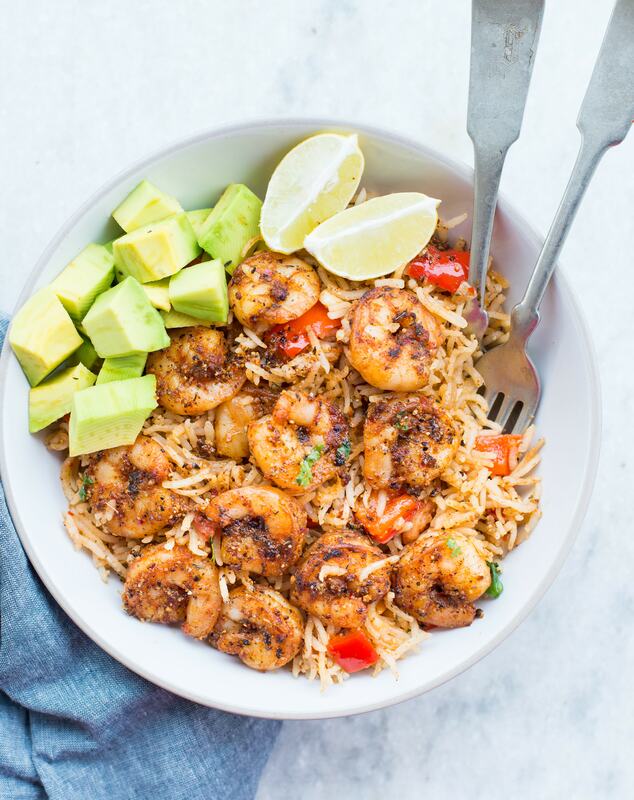 A perfect Shrimp and rice recipe, that takes less than 30 minutes from stove to table. 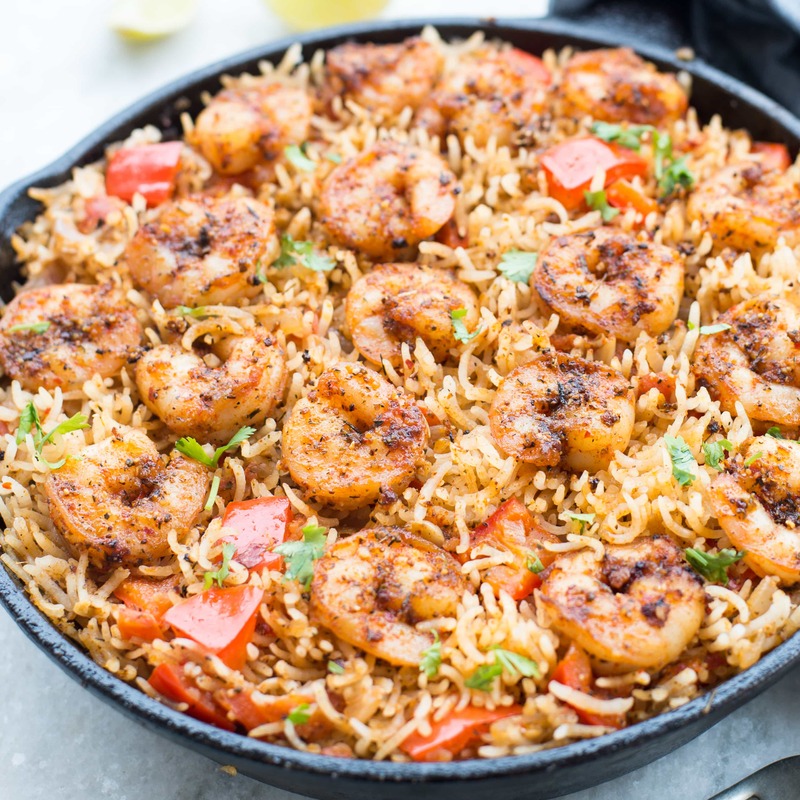 Before I start telling how good is this Cajun Shrimp and Rice Skillet, just have a look at the skillet. Doesn’t it look delicious and mouth watering? Well, it not only looks delicious, tastes amazing too. I love Cajun Spice a lot. It is spicy with loads of flavour. I usually use it as a spice rub for chicken, shrimp. Cajun Seasoning works with vegetable too, for example, this Baked Crispy Cajun Potatoes I had posted earlier. It is spicy and flavourful. I use homemade Cajun Seasoning whenever possible. The bottled ones we get here lacks flavour ( in my opinion). So I always make the fresh seasoning depending on the quantity required. Homemade Cajun Seasoning is the best. I mix 2 parts garlic powder, 1 part each from Onion powder, Oregano, thyme, paprika, chilli powder, peppercorn and peppercorn. Put everything in a food processor and whisk a couple of times. The seasoning should remain little coarse. You can always adjust the spices as per your preference. Cajun Shrimp is so delicious and I always make it as an appetizer. It Comes together in 10 minutes and tasted amazing. Use a cast iron skillet while making Cajun Shrimps and stir-fry the shrimps for 4-5 minutes on high heat. Tossing in high heat gives a nice smokey touch to the shrimps. Simply add Cajun Shrimps to your favourite pasta and Cajun Shrimp Pasta is ready in no time. You can also make Cajun Shrimp tacos with it. You see, the possibilities are endless. 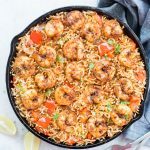 Now let me tell you about this one pan easy Cajun Shrimp and Rice Skillet. You know Rice is my weakness and I can’t think of a single day without having rice. 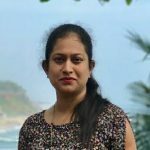 Since past few months, I have been following a low carb diet and the most difficult part is to avoid rice. I am able to control all my cravings but rice is something I can’t live without. 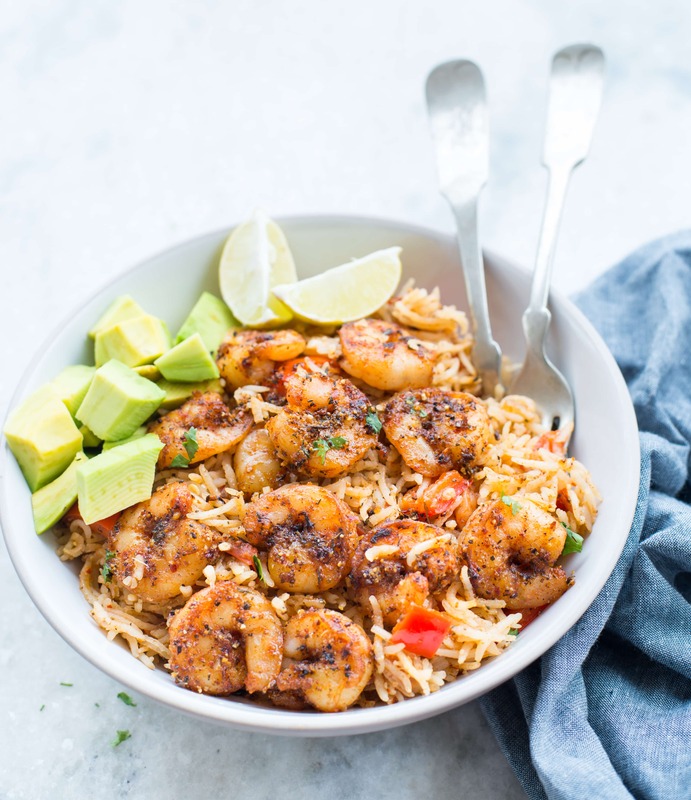 I love everything about this Shrimp and rice recipe. It takes only one pan and less than 10 ingredients to make this. Start with gathering all the ingredients for the recipe. Fresh Shrimps and Frozen Shrimps, both would work for this recipe. If using Frozen Shrimps, then thaw them and get rid of any extra liquid. Add some Cajun seasoning and let it rest for 10 minutes. I have used long grain basmati rice here, you can use any other varieties of rice. What I love about long grain basmati rice is its lovely aroma. Just before starting cooking, wash rice under a running tap, until the water runs clear. Let it soak for 15-20 minutes. Soaking rice helps in faster cooking. Use a pan that is big enough to hold rice after it gets cooked. Too small a pan and rice will not get cooked properly. Heat Oil in a pan. Add Shrimps to the hot pan and cook each side more 2-3 minutes. Remove from the pan and set aside. Add chopped onion and minced garlic to the same pan. Once the onion starts to brown add tomatoes. Cook further 5-6 minutes till everything come together. Add chopped bell pepper, soaked rice and Cajun Spice mix. Add warm stock, cover and let it cook in low heat. When rice is cooked 3/4th, add shrimp and let it cook for another 8-10 minutes. When done, switch off the flame and let it rest for 10 minutes. Before serving using a fork gently separate rice grains. 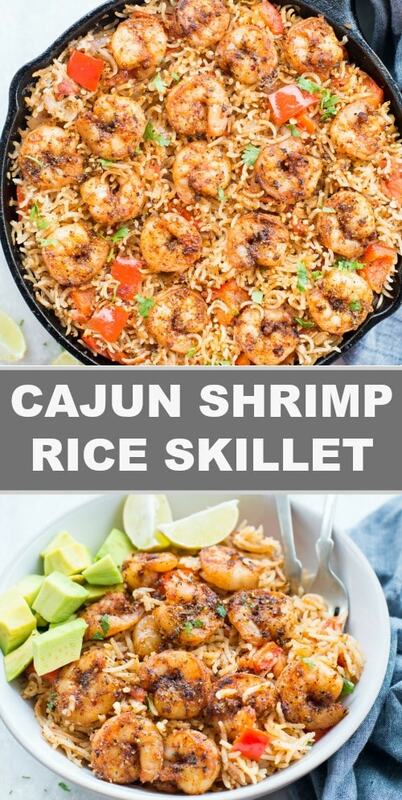 CAN WE FREEZE CAJUN SHRIMP AND RICE SKILLET? It can easily be refrigerated like any other rice dish. You can divide into small portions and do the meal prep as well. 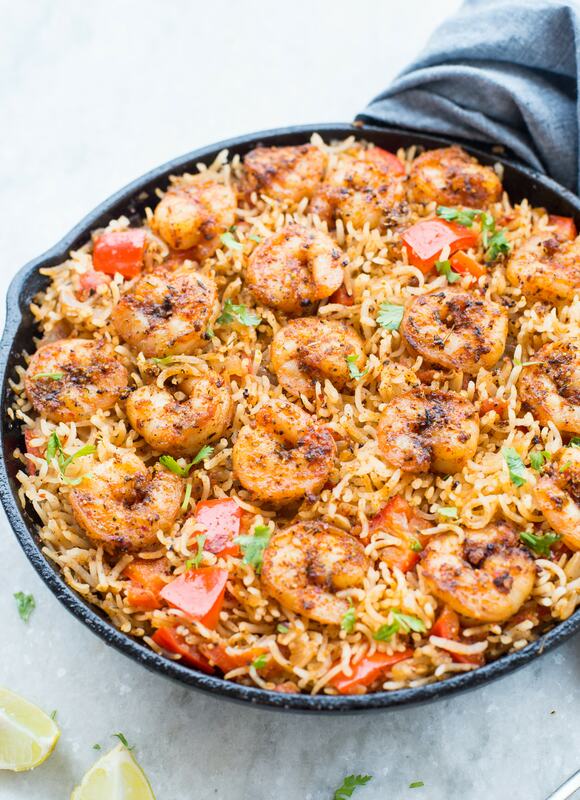 Delicous one pan Cajun Shrimp and rice skillet for famili dinner. Wash rice under running tap until the water runs clear. Let it soak while we do rest of the steps. Drain any extra liquid from shrimp. Add 1 tbsp Cajun Spice mix. Mix well. Heat 1 tablespoon oil in a pan. When hot add shrimps. Cook on medium-high heat for not more than 2-3 minutes each side. Remove from pan and keep aside. Add remaining oil to the same pan. Add chopped onions. Cook until onion is softened. Add minced garlic. Cook further 2-3 minutes. Add chopped tomatoes. Cook until tomato softens. By now onion, garlic and tomato mixture would have come together. Add Cajun spice mix, chopped red bell pepper and drained rice. Give everything a good mix. Add warm chicken stock. Cover and cook untill the rice is cooked 3/4th. Stir in shrimp. Cover and let it cook another 8-10 minutes on low flame or until the rice is cooked through. Let it rest for 10 minutes before opening the lid. Using a fork gently separate the rice grain. Serve along with avocado and lemon wedges. The amount of stock varies depending on the rice used. So add stock accordingly. I have used a little more than 3 tbsp of Cajun Spice mix. You can adjust the quantity as per your taste. My Cajun mix already had salt. So I added very little salt. The chicken stock might also contain a little amount of salt. So add accordingly. Very simple to make! Great flavor. A tad too salty for me so I would probably cut back a bit on the cajun seasoning. All over though, very tasty. Thank you for trying. Yes because Cajun seasoning has already salt in it, while adding extra salt we need to be careful. And also the stock has salt in it.